03.10.2004 - This is not a photograph that I took. Someone else took it for me. The reason is because I don't get any skunk calls here in Orlando Florida. It's too bad. I like skunks. I even like their scent. I have a thing for skunk scent. But I haven't smelled it down here, not even on the highways. Up north in Pennsylvania, where I grew up, skunks were common, and every few miles down the road I had the pleasure of sniffing one. Alas, such is not the case here. I did do a fair amount of skunk control and trapping while I was training as a wildlife removal specialist in Pennsylvania. They were not hard to trap - similar to opossums. Just set the appropriately sized trap in the area the skunk frequents, bait, and wait. Skunks eat a variety of foods, and dry cat food and marshmallows seemed to always do the trick. The one thing to be careful about when skunk trapping, of course, is the threat of being sprayed. Even though I said I like skunk smell, I like it diluted, at a distance. Up close and personal, it's a whole different ballgame. You don't want to be sprayed, nor do you want a discharge in your truck. The smell will last for a long time. To avoid being sprayed, just read the warning signs. If the animal seems agitate and stomps its feet and God forbid turns around and raises its tail, get out of the way. But if you approach it in a calm manner and make no sudden movements or hurt it, it shouldn't spray. To be safe, just drape a towel or plastic sheet over the trap, and pick it up that way. You'll be shielded if it does spray. If you don't want to do skunk control on your own, hire a pro. Do it yourself: Visit my How To Get Rid of Skunks page for tips and advice. Skunk Trapping techniques - When it comes to wild animals of skunk size, there are two options for trapping: lethal and non-lethal. Lethal trapping will involve leg-hold traps and body gripping traps. Non-lethal trapping is accomplished using a cage trap model bought at the farm store or purchased online. People think they have to kill a skunk because of the looming threat of being sprayed. This isn’t true; in fact, skunks are more likely to lose control of their spray mechanism in death than they are in life. 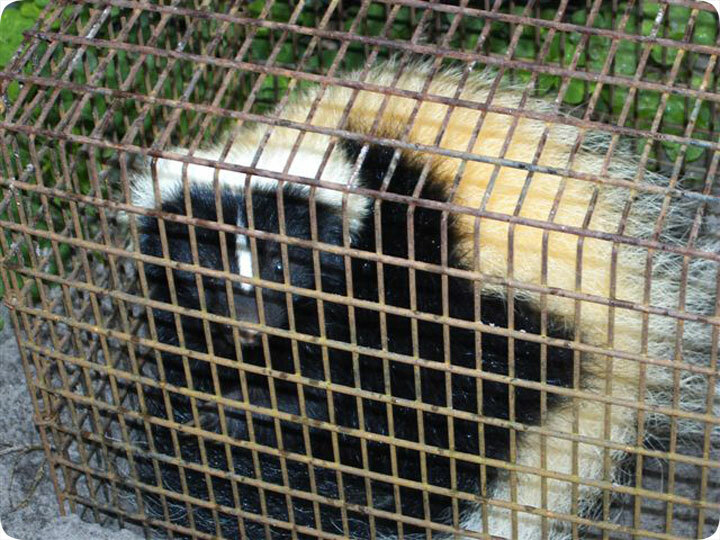 There is no need to kill a skunk to get it off your property, so cage trapping is often the most common method used. For this type of scenario, you can purchase a large cage trap at the garden center or you can buy a special skunk trap online. The traps online have solid sides to prevent any spray from reaching you if that does happen, and the elimination of visual stimuli will also keep the skunk calm. You can achieve the same structural advantage with a regular cage trap if you cover the top and sides with a tarp. If the skunk can’t see you when you approach it, it won’t waste its spray. What should I do if there is a skunk in my house or garage - The first thing you need to assess when there is a skunk is garages is if it’s in there deliberately or if it got closed in there by accident. If the poor critter was just locked in there as it satisfied a curiosity, you can probably open the house door or garage door and wait for it to come out on its own. Chances are it won’t spray, and though it doesn’t smell like roses in general, you can air out the garage after it leaves. You also need to determine why the skunk wanted to inside the shed, house, or garage. Is there pet food out? Did you store some garbage bags in there? Remember that animals are primarily driven by a need to eat or to find shelter. Something about your garage was appealing and you should try and find out what it is. If the skunk is living in your garage, you probably have a hole somewhere in the exterior that is letting the critter inside. This hole needs to be found, and the skunk needs to be trapped and removed. You can purchase a cage trap at the local store and use that to take care of the problem.